Property Info: 2BR/2BA Beachfront Property with 1400+ sq. ft.
Beach Colony condo for sale in Perdido Key. WOW!!! 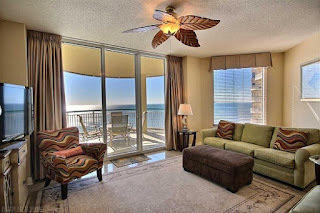 This Luxurious 15th floor penthouse condo in the beautiful Beach Colony East Tower! Open and spacious 2 bedroom, 2 bathroom condo fully furnished with the finest of tastes. Tile floors throughout and carpet in the bedrooms & granite counter tops. The master bedroom has a king size bed, walk-out balcony & the master bath has a jetted tub with beautiful gulf views and a separate walk-in shower! This penthouse has a 300 Sq.Ft. balcony, large and spacious! The Beach Colony has ideal amenities, including: 2 outdoor pools, heated indoor pool, hot tub, tennis courts, fitness center & a grilling area! You don't want to miss this one!! !